Baghdad, 2003. The War on Terror has been raging for two years. Iraq's capital city has been devastated, and without a police force to keep its citizens safe. In an effort to establish some semblance of order in the war-torn city, Florida cop-turned-military consultant Chris Henry has been assigned to train a new group of cadets who will take up the cause of law enforcement. But even those with good intentions are not immune to the chaos found in the post-9/11 Middle East. When one of Henry's trainees is found dead, he's forced to align himself with Nassir, the last policeman in Baghdad to try to unravel the bloody mystery that's already claimed one life. While Henry and Nassir search for answers there are forces in the shadows pulling strings that these men don't even know they're tied to. 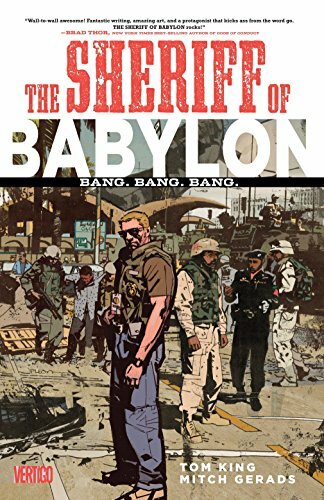 With a wonderfully brutal script by Tom King (GRAYSON, THE OMEGA MEN) and devastatingly beautiful art by Mitch Gerads (The Punisher, The Activity), this wartime crime crama takes you deep into the underworld of the city of Baghdad in one of the most tumultuous times in modern history. Collects SHERIFF OF BABYLON #1-8.